Four styles of mist eliminators are offered for the removal of liquid droplets and mists from air streams. Mist eliminators offer >99% removal efficiency. Chevron Curved Blades: for maximum economy with low pressure drop 2-6m/s gas velocity. Kimre Composite Mesh Pads: for highest efficiency removal over 1μm for 1-3m/s gas velocity. Packed Beds: for over 10μm for 1-3m/s gas velocity. Cyclone Separators: for contaminated air streams that may plug or precipitate. Pilot Plant available on request. 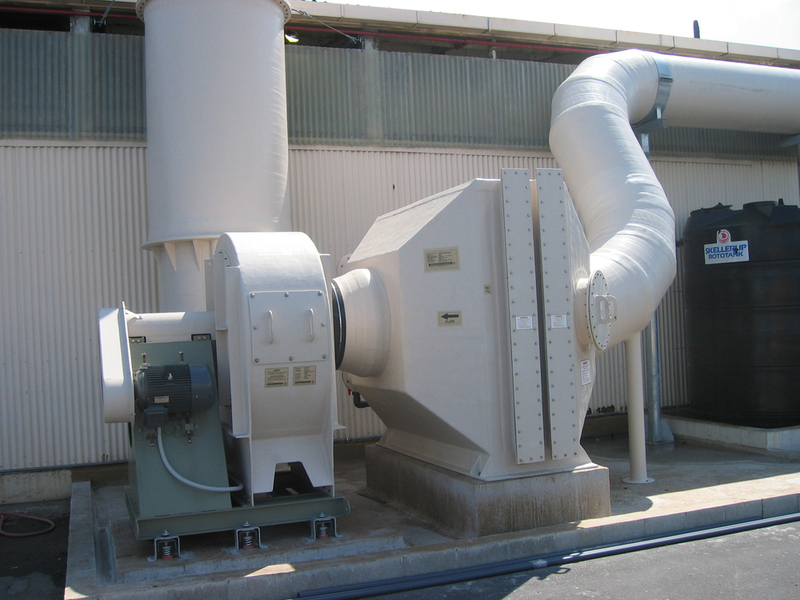 Chevron-type mist eliminators work on the principle of direct impaction combined with centrifugal force. The liquid droplets are collected in a series of troughs located in bundles of parallel curved blades. Removal efficiencies of 99+% over a range of gas velocities of 2m/s to 6m/s. Design optimises moisture removal and pressure drop to provide most economical system. Modular units accommodate a wide variety of vessel cross sections including round, rectangular and irregular shapes for optimum effect. Wide range of module sizes for specific applications. Smooth surfaces minimise solids buildup; units seldom require maintenance. Where flush sprays are required, standard 35mm blade spacing permits easy penetration. Highly corrosion-resistant and can withstand a wide range of temperatures, depending on material of construction. Available in plastics and stainless steel. liquids can be stopped with coarse styles while less coarse styles eliminate small liquid droplets. Removal efficiencies of 99+% for droplets and particlates above 1 micron over a range of gas velocities of 1m/s to 3m/s. Highest collection efficiency of any material. Collection efficiencies are much higher than wire mesh pads as Kimre pads have 93% of the fibres perpendicular to the gas flow. The number of layers in a required mist eliminator can be determined experimentally or calculated based on data from Kimre. The composite pads are a robust design and less sensitive to fluctuating operating conditions. Available in a range of plastics to suit the service conditions. Polypropylene is the most commonly used material. Mesh pad packs are light in weight so are easily handled and installed. Can be made into cassettes so that they can be removed and replaced in a short time, eg for cleaning. Tellerette Packing Type 2R is located at the centre of the picture and is used as a mist eliminator, especially in packed bed scrubbers. Tellerette Packing Type 1 is located at the lower left of the picture and is used in smaller diameter applications. Packed bed mist eliminators work on the principle of direct impaction. The liquid droplets are collected in a direct impact with a portion of the packed bed media. Armatec typically supplies this style of mist eliminator with Tellerette Type 2R as standard. More information on this packing can be found in a specific bulletin on Tellerette packing. A 300 mm deep packed bed of Tellerettes Type 2R will remove 99+% of droplets 10 to 1500 microns in size. Extremely low pressure drop due to open nature of packing. Packing placed by random dumping onto a grid of packing support plates. Packing is available in a range of plastic materials. Polypropylene is standard and is moulded in New Zealand. Tellerettes Type 2R are moulded in New Zealand and are readily available ex stock.